Happy Thanksgiving to all the US readers!!! Today is a day to spend with family and friends enjoying a wonderful meal, but tomorrow marks the official start of the Christmas Shopping season with Black Friday. So I created a project to help you get in the Christmas spirit. I picked up these wood letters at my local craft store and I love that they stand up on their own. I gave them a few coats of white paint and once that was dry I misted each letter with Iridescent Pearls Maya Mist for a little sparkle and shimmer. 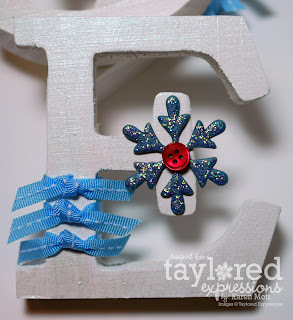 To decorate the letters I used images from Wings of Joy and Holiday Wonder, both available at Taylored Expressions. I love how these two sets can mix and match. I started by stamping the images with Memento Tuxedo Black onto Choice Snow White then I coloured them with copics. Then I started adding the little touches to really jazz up each image. The tree was decorated with Tiny Twinkles. 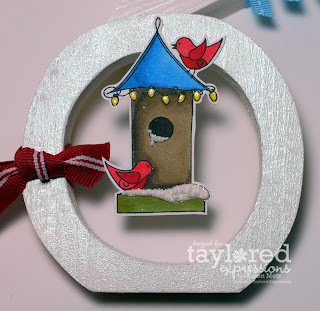 I coated the lights on the bird house with two layers of clear Glaze pen and added some sparkly snow to the bird house (white Liquid Applique topped with glitter before I puffed it). The chipboard snowflake was coloured with a blue copic then I coated it with Waterfall Stickles and topped it with a button from my Whirligig pack. 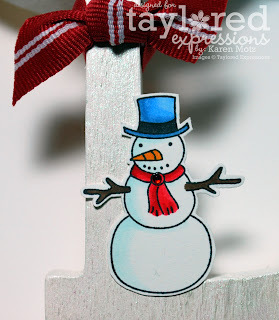 The snowman received a hint of bling with a red Tiny Twinkle on his scarf. I also made some quick paper trees to accent my word art. 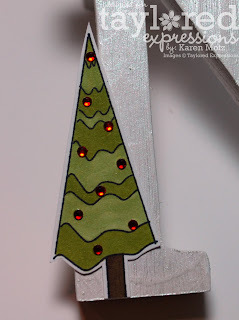 They were super simple...cut two triangles of the same size for each tree (my trees are 6, 5, and 4 inches tall). On one of the triangles, cut along the center line from the bottom to the mid-point. On the other triangle cut along the center line from the top to the mid-point. Then just slip them together...voila! No adhesive required and they'll fold flat for storage. Taylored Expressions is having a big sale this weekend in honour of Black Friday and Cyber Monday, the two biggest shopping days of the year! The entire store is 15% off!!!! Just use the promotional code TEBlackFriday upon checkout to receive the discount. Also, Tiny Twinkles are buy 2 get 1 FREE, JustRite products are 50% off, and there are the sweetest new TE shirts and aprons!!! So skip the lineups and save some time, money and gas by shopping at Taylored Expressions from the comfort of your own home this weekend! Super cute, my friend! Cool trees too! OH my gosh, KAREN!! This is AWESOME......totally eye catching and so beautifully done. I LOVE IT!! sweet Holiday decor, I love it!! Karen, how fabulous is this!? Oh my goodness! This is SO beautiful Karen! What a perfect way to decorate for the holidays! LOVE this my friend!! love this project and those cute trees! Awesome, Karen -- love this! !